Things seemed to fly by so much faster during a four-day work week. I didn't have any plans for the weekend except house chores since John worked (in exchange for two extra days off for our upcoming staycation). Once that started, I knew there would be little time to tidy up the house. As it turned out, not having plans was a good thing because it left my schedule flexible for spontaneity. My friend Jameie called asking what I was doing and one thing led to another. Soon her cousin's sweetie (and my friend) Kristen had the same dilemma. Hmm, house chores ... or Girls' Day? So we met up and went to Town Square for some shopping and dining. 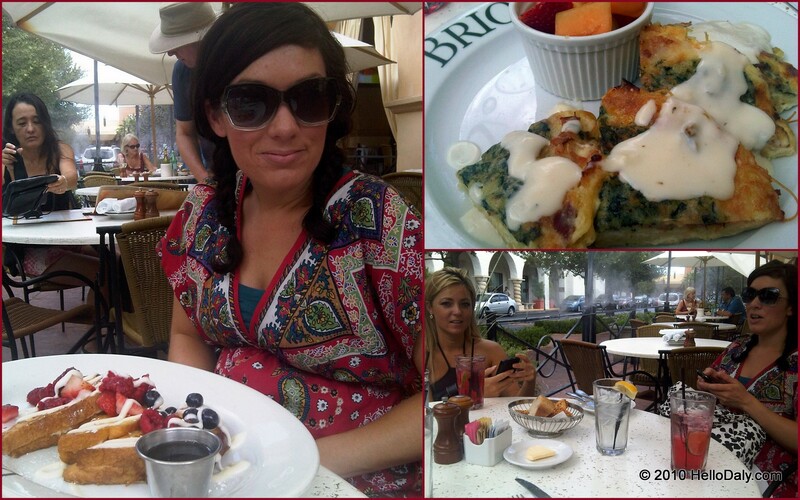 First things first was to take care of our appetites at Brio Tuscan Grille so we could have energy to shop. The brunch, served only on Saturdays and Sundays sounded so good on the sunny patio. Okay, so it's hot in Vegas but we were under a shaded umbrella surrounded by misters. 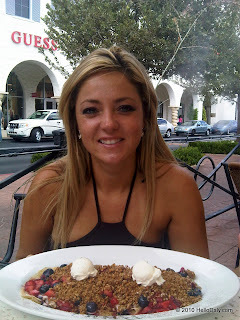 Jameie had ricotta crepes topped with fresh fruit and granola drizzled with cream cheese. Kristen had mascarpone-stuffed french toast, sauteed golden brown and topped with fresh berries and vanilla cream cheese drizzle. I had the Frittata Al Forno: a layer of eggs, angel hair pasta, crisp bacon, onions, spinach, artichoke, Fontina cheese, and Parmesan cream (very rich) but it was served with fresh fruit ;-P.
We washed it down with a thirst quenching berry soda cocktail with a virgin version for Kristen, the expectant mother. Brunch was so nice we didn't want to leave but we had many stores to visit and soon we were off. Store after store, I had so much fun I lost track of time. You see, shopping is only fun with good friends (I don't like in-person shopping and try to avoid it doing it alone unless necessary). Of course we had to take a break at YogurtLand, a tradition of Jameie and her son. By the time I got home, it was late but it wasn't too late to watch the Tour de France and for my fashion show (John likes me to model the loot). I am glad I didn't have anything on my agenda going in to the weekend because sometimes the best things happen when they are unplanned.